Many Egyptians have cats and dogs for pets and love them dearly, but life for the street cats and dogs is hard. People give handouts to the feral cats, but feral dogs seem to be considered more of a nuisance than cats. Regardless, I saw bowls of water, usually near shops and entry ways of large apartment buildings where both cats and dogs quenched their thirst. My "adopted" hall kitties are part of the group of feral cats that live in the halls of the 11 story building where I rented the apartment. Those that came to my door on a fairly regular basis are 2 adult females and 2 two-month old kittens. Once in a while a black cat, probably a year old, showed up. 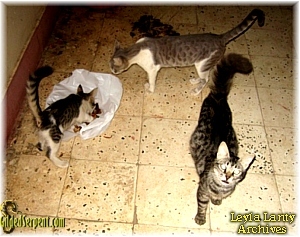 The kittens want to follow me back inside the apartment. Even the young ones know where the food comes from! Everyone always carries a packet or two of facial tissues for various purposes. 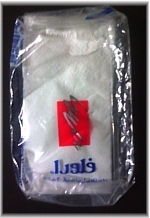 The Egyptian version of facial tissues is very thick, more like a paper napkin than our sneeze catchers. Most restaurants put boxes of them on the tables for customers to use as napkins. Sometimes on the way to some activities, I feel a need to “pee” and that can be a real problem. Retail stores do not usually have toilets for either customers or staff. Where people "go" I don’t know for sure, but I have sometimes found myself using an ancient form of what I call a “squat toilet” where you place one foot on a raised foot rest on each side of a ceramic or concrete square with a hole between the foot rests and squat. Sorry, no photos! Needless to say, when I’m out and have to go, I look for an American or European style restaurant and use their toilet. No one seems to mind. Shopping malls usually have very nice public restrooms too. McDonald’s, KFC and Pizza Hut restaurants always have super clean bathrooms and some of them even have toilet paper! I always carry some facial tissues just in case. In the photo, the last tissue in a pack of “Flora” floral-scented tissues. During my stay in Cairo, I visited Houda el Artist, composer and accordion and keyboard master, at the music studio owned by him and his brother, world-famous drummer Sa3id el Artist. Houda composed two of the songs on my CD “Golden Days Enchanting Nights” and played a major role in its production in Egypt. We discussed various topics in music, friendship, etc. and drank tea and yansoon (anise tea). We had a nice long talk about dancing with the music and about the “dance like an Egyptian or any other Arab” course I’m planning. According to him, I’m on the right track. I got the same reaction from Raqia when I discussed it with her, so I’m going to go ahead with my plans and offer it mid-winter. We talked again about the social and political situation in Egypt and he said he thought things will get better in 2 or 3 years but it will be a bumpy ride. 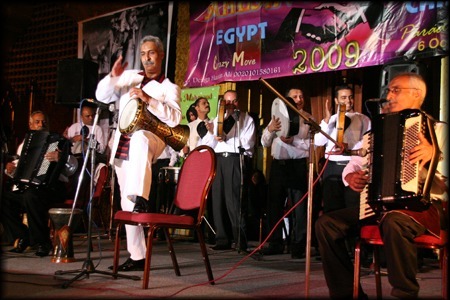 In the photo, Houda el Artist on accordion at right, Sa3id El Artist on tabla (darbukka) in center and brother Ali el Artist on accordion at the left at Ahlan Wa Sahlan Festival Cairo 2009. A few days before leaving, I met with Ahmed and his family at their flat (in the same building as mine) and we walked about 5 blocks to the home of Ahmed’s daughter-in-law-to-be. I walked with the ladies, a 2-year-old girl, Habiba, and a 3-year-old boy. I’m glad the kids were with us, forcing us to walk slowly, because the unpaved street was difficult to walk on, with lots of potholes, rocks and ruts. We got to the building and the elevator came when called but the car was about 1.5 feet above where it should have been! In apartment buildings, the bowabs (doormen) know how to fix them but I wasn’t about to get into it in that condition! The elevator was just big enough for 2 adults, 3 if they’re slim, and the misalignment combined with the claustrophobic size did not appeal to me, so up the 3 flights I climbed. While waiting for dinner to arrive (delivery from a nearby seafood place), we ate grapes and freshly cut melon and there were many animated conversations among the dozen or so people who were present. It was great fun to watch Karim and the other young men playing with the children, teasing, gently pinching then hugging them then “bench-pressing the toddlers,” lifting them like weights and swinging them around and the children squealed in delight. After dinner of delicious shrimp, grilled fish with special spices, salad, brown rice, followed by tea, yansoon (anise tea), karkady (hibiscus tea), Mdm. Shadia and her niece May pulled me into the back bedroom for some real partying with the ladies. We took turns dancing solo and dancing with each other. Following Shadia’s intricate sha3abi-sharqi moves was difficult at times but was a real opportunity to learn that style of dance. We danced to a new recording of the song “Akdeb 3aleik”. All four of us women took turns to show how we dance to this song. Each one had different ways of interpreting it and each version fit the music beautifully! Next evening, I met with Mdm. Shadia at her and her husband’s household items shop in the Sa3ida Zeinab district so we could have some private time to sit, drink tea and chat. We did just that for almost 2 hours while customers occasionally stopped and shopped. 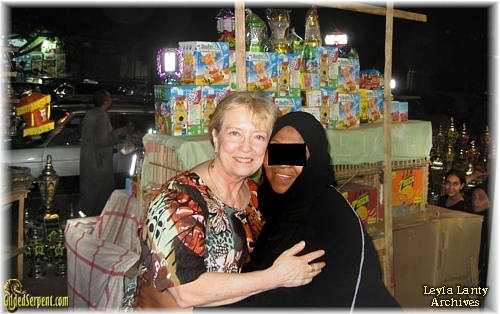 It was less than a month before Ramadan would start and like many other shops in the area, her shop offered for sale Ramadan lights that people use to decorate their homes for the 3eid, the celebration held at the end of the month of fasting. 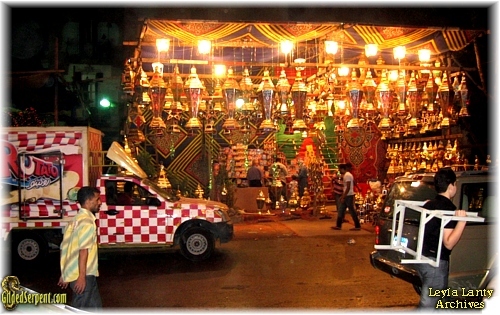 In the photo, Ramadan lights for sale outside Mdm. 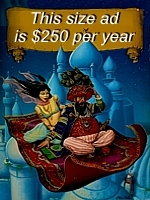 Shadia and her husband’s shop. I did not get permission to display her photo so I have partially covered her face to avoid embarrassing her. I spent my last evening in downtown Cairo shopping for a “bling-y” abaya, the long loose robe that many of the women wear sometimes on the street and often for special occasions. I found one with an unusual asymmetric design of sparkling rhinestones on black fabric – plenty of “bling” and elegance, gorgeous! On the way home we stopped on a side street close to the home neighborhood for delicious kofta (ground meat kebabs). What a yummy way to wrap up my stay in Cairo!